In Romania my favorite reading genres, Fantasy and Horror, are covered in a very small measure. These genres and Sci-Fi are still seen as bad literature and unserious. However over the last few years these genres have set a small step in our literature market. With a greater opening toward the English titles, I mean here that it is much easier now to buy the books from outside through the online bookshops, and with our publishing houses trying to bring at least the heavy names of the genres it seems that my favorite genres are finally trying to establish themselves in my country. But still they have a long way to go. Anyway, one of the publishing houses which try to bring us the wonderful titles of these genres is Minerva. Minerva steps alongside with the publishing houses which promoted these genres so far, like RAO (with many Fantasy and Horror titles and with the rights for Robert Jordan’s “Wheel of Time”), Nemira (with a long line of Sci-Fi titles, Stephen King’s novels and with the rights for George R.R. Martin’s “A Song of Ice and Fire”), Tritonic (a new name on the market, focused mainly on the new titles and authors of these genres, but which still needs to work on their book format and presentation) and Millennium Press (a smaller publishing house, with laudable efforts and with very attractive upcoming titles). 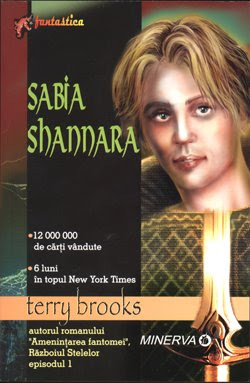 The wonderful efforts of Minerva brought in Romania the series of Terry Brooks, “Shannara”. And I am not certain, but I heard that they have the rights for some of R.A. Salvatore’s titles. However, as much as I appreciate their efforts I could not buy their second title. Trust me, I tried to, but seeing this cover art I couldn’t take my money from the wallet. Now, I am perfectly conscious that the most important part is between the covers, but still. I believe that the cover art plays a role in the selling process and to the pleasure of reading and owing a book. And with our consuming society today it plays quite a role. So although Minerva treat us with Terry Brooks’ titles the job made on the cover art is bad. And with all the respect if they keep it up like this I will stay with the English versions. OMG! This the most stupid cover in years. A plain, white cover, with just the title and author's name would be much, much better than this one, which clearly works against the book itself. Having that "packing", no wonder that lots of people think that this is bad reading. damn that`s an ugly one...i saw one with an old guy on the cover too, in the same series i guess..
hahahahahaha. Oh my god that's hideous! There have been books I aven't bought because i'd be embarrassed to take it to the till. I like simple book covers. I know lots of marketing research goes into choosing the right cover art, but here in America too I find that often publishers choose some god-awful cheesy fantasy art when a plain, tasteful cover woud serve much better. Art is such a subjective thing anyway. I have read in marketing one's book that the first two things that count on a reader purchasing a book is the cover and the blurb on the inside jacket cover or the back cover. If the visual image on the front cover does nothing to enhance the potential reader to open the book then the sale is doomed. Another problem authors have, is often they have no say in what goes on the covers, either in their own country or internationally. I think this is an issue that should be brought up when the publishing contract is negotiated.